This site puts into context different aspects of cancer. There will be a slant towards radiation therapy and medical imaging, as I am a physicist. This site will not give answers such as which symptoms point to what diagnosis, or which therapy is the best. Such answers can only be found by consulting a good clinician — not by surfing the web. Here's why. "Why me?" is perhaps the most frequently asked question. A symmetric question is becoming equally valid. It takes some discipline, but refrain from googling to match symptoms to diagnosis, or to match diagnosis to outcome. Whereas chemotherapy can be packaged in the form of a manufactured, quality-controlled product, radiotherapy cannot. Some instruments I encountered were particularly agonising; I dreaded any repeat on the second round. Whether 1% or 99%, a therapy could still either succeed or fail. There is more to cancer than mere fighting. This aspect is real. Some fork out all they have. Money does seem capable of extending lives. The instruction not to move during radiotherapy is quite different from that when taking an X-ray. This myth enjoys the same publicity as that about microwave ovens causing food toxicity. Target the tumour, spare the rest, sharpen the cross-hair, aim only at the bullseye, miss nothing. "Why me?" is perhaps the most frequently asked question when one starts exploring radiotherapy. Personal associations with cancer naturally perturb day-to-day focus or non-focus. By objective probability, however, cancer prevalence is so high that a symmetric question becomes equally valid, "Why not me? Why not my loved ones?" I spent 18 years in the field. Serving yet-to-develop communities in jam-packed clinics, I experienced first-hand how the demand for radiotherapy exceeded service availability. The hope for healing and the labour of love were intense. Hope not reduced and labour not discounted, I was also among forefront research teams, sharing the corridor and institution with Nobel laureates. In solidarity with cancer patients and survivors, cancer carers and researchers, let us first put aside the social stigma. Cancer is an illness, not a condemnation. It is one of the many types of illness. Cancer is a diagnosis (that cells multiply without knowing when or how to stop), not a verdict nor a forecast pointing to any specific eventuality. Before the onset of any cancer, many cancers have already been prevented. Before cells multiply without knowing when or how to stop (a condition known as 'cancer'), all this while the body had tirelessly and unassumingly prevented many would-be cancers -- a beautiful self-healing process, although it cannot guarantee that it will never fail. Without this built-in mechanism, all of us would not only have cancer but have it far earlier. acknowledge the self-regulating cell multiplication at work in our bodies so gracefully, up to this point at least. In solidarity we are always stronger, even as the pains in life become very real. The yolk is spread across more shoulders. The issue becomes less of a self absorption and less of a lone range. to relate oneself to personal accounts of diagnostic/treatment success/failure -- the logic does not work like choosing hotels based on customer reviews. Answers to the above can only be found when presented personally to a good clinician, who would be able to deduce true positives and true negatives. Google will not be able to tell us how to get these right. The question is simple, "What is the best cure?" But the answer is too complex, because there are too many factors involved. Some factors aggravate each other; other sets of factors cancel out each other. Table 1: The four possible outcomes of a diagnosis. A false positive is where the illness is reported to be present but in fact it is not. A false negative is where the illness is reported to be absent but in fact it is present. A true positive is where the presence of the illness is reported and it is rightly so. A true negative is where the illness is reported to be absent and it is indeed absent. which are not possible unless the reader is an expert in this particular field. Radiotherapy, chemotherapy and immunotherapy are the treatment options presented to cancer patients, sometimes in combination. Radiotherapy takes the physics route; chemotherapy takes the chemistry (or pharmaceutical) route; immunotherapy is less common. Sometimes preceded by a surgical removal, both radiotherapy and chemotherapy are based on the same principle of what Chinese refers to as, 'attack poison using poison'. In radiotherapy, radiation is formulated and administered in such a way that the radiation type, energy and dose destroy cancer while sparing the rest of the body -- to the best endeavour. Likewise, in chemotherapy chemicals are formulated and administered in such a way that the substance and dose destroy cancer while sparing the rest of the body -- also to the best endeavour. Significant research has been translated to the clinic (or the bedside) over the recent decade. Radiotherapy and chemotherapy today spare the rest of the body far better than how it used to. This sparing has yet to reach the ultimate goal of 100%; side effects therefore remain above zero. The mantra is to eat as much as one can; the body would counter side effects better. Feed generously without reservation; the benefit is surer than any specific therapy regime. Radiotherapy itself offers a variety of options often within the same hospital; chemotherapy too. The range differ dramatically in terms of affordability, accessibility, availability, insurance coverage, marketing strategies and consumer perception. Expensive options are not necessarily better. In communities where hospitals compete for business or where health service is not national, hospitals often acquire expensive technologies just for boosting profile and marketability. Once acquired, these hospitals face tremendous pressure justifying the investment and creating sufficient patient load. Advantages over other options are often over-rated; compromises are often intentionally omitted. Successful therapy lies neither in the price tag nor the advertising banner. Whereas much of chemotherapy can be packaged in the form of a manufactured, quality-controlled pharmaceutical product, radiotherapy cannot be packaged that way. Radiotherapy leaves many loose ends to the local multidisciplinary team to tie up; these loose ends are intended by design so that treatment may be tailored to the individual patient. The integrity of each of the many teams involved is no less critical than the integrity of team-to-team relay and feedbacks. In communities where established healthcare protocols are lacking or weak, this aspect of integrity is the key when choosing a hospital or a treatment modality. Medical procedures may be scary, painful or humiliating for some. That notwithstanding, it would be good to first acknowledge that bioengineering and technology have come a long, long way to make medical procedures and interventions more bearable, if not more pleasant. These include revolutionary designs of syringes, colostomy bags, scissors and every piece small and big along the lineup. I had a surgery as a 6-year-old, followed by a similar surgery 6 years later. Some instruments I encountered were particularly agonising; I dreaded any repeat on the second round. True enough, 6 years on, many daunting pieces had disappeared from the entire scene. Even during that era, in an obscure town of a struggling nation, technological advancement was too great to be missed. Even more so today. Numbers, statistics and percentages are really more for service providers than for individual patients. The data helps policy-markers do a better job and helps doctors make wise and informed decisions. Individuals patients should not hang too much on popular statistics suggesting x% survival of y number of months. Take these with a pinch of salt, as they do not really apply to individuals. Whether 1% or 99%, a therapy could still either succeed or fail, a particular individual could still either survive or not. Take the uncertainty, rather, as a window of opportunity for God's merciful intervention. There is more to cancer than mere fighting. Rather, it is a moment for discernment. There is no point fighting for fighting sake and there is no point being strong for the sake of being strong. Rather, discernment is the key. At this moment in history, at this point in place, for this particular person here and now, what is nature's prompting? If the prompting is to march on defying all conventional wisdom and against all statistical guesses, we should then live up to that call without waver. If the call is to complete our mission at a certain point and let go, with equal boldness (nothing less, nothing more) let us answer that call. It is a moment to get in touch with ourselves. Whereas it is true that healthcare stands out as the most profitable industry, most researchers (who make modalities possible) are hardly ever profit driven. Researchers like myself, driven by what they believe, persist on finding solutions to problems others dismiss as unresolvable. Researchers make options available; each option serves a subset of patients given a specific circumstance. Unless passed on to profit-making business, fruits from research hardly reach the public. By passing the fruits to the companies, no single solution is meant to be sold in the marketplace tooting as the ultimate best. Nor is it meant to be offered at a cost dividing the community into those who can't afford from those who can. Yet, the money aspect is real. Some families fork out all they have in exchange for that glimpse of hope. Money does seem capable of extending lives, after all. A basic need (which should be met unconditionally) becomes a luxury (to be deserved and transacted). This is the point where a community can skew a social order and lose all sense of solidarity. At such a juncture, personally I would count it an open choice whether — or not — to opt for a form of treatment that is exclusive. Yes, many people buy insurance to the max. At the end of the day, uncertainties are beyond our control and are best left to the caring hands of the creator. I insist on the importance of solidarity. There was a day during primary school when teacher asked us to bring two dollars the next day. We were to go home and tell our parents that the two dollars was the premium towards an insurance policy. Teacher cited the example that given 50 of us in the class, in an unfortunate event that anyone gets knocked down by a car, the pooled money would then be used for that anyone-of-us. One would be able to afford what he or she could not afford alone. Insurance was about a shared pool, not self protection. Those with radiotherapy experience readily recount how radiographers, more than one at any one time, fussed over millimeter precision when preparing the patient at each session. The fuss is absolutely justified. Radiographers are always meticulous with tattoo markings, laser alignments, moulds and other positioning and immobilisation devices. It is their job to place the patient, particularly the part of the body receiving treatment, in exact position with respect to the radiation beam. Any deviation would cost missing the tumour and hurting non-tumour areas. The instruction not to move during radiotherapy is quite different from the instruction not to move when taking an X-ray. Moving during an X-ray shot would blur image the same way motion causes blur on a photograph. If the patient moves during radiotherapy, on the other hand, the tumour escapes dosage — the dose hits healthy cells instead. Keeping nice and still can be a challenge. I know, as I had countless X-ray episodes as a kid. Some conditions do make it impossible for the patient to remain still, in which case the clinician would adjust the margin of the irradiated area to accommodate the patient's condition. Do not be afraid with the word "nuclear". Taking "nuclear" medical procedures does not make one any less moral or any less green. It has nothing to do with wars and it has nothing to do with harming the mother earth. Your body and mine are all naturally nuclear; all matters are by constituents. That's how God created the universe. Please liberate yourselves from the misconception. Would one prefer MRI over nuclear medicine, discriminated just by the word "nuclear"? Well, MRI is arguably far more nuclear than nuclear medicine. The scientific community uses the term NMR (Nuclear Magnetic Resonance). Dropping the word "nuclear" during its inception to the clinic, so we have MRI (Magnetic Resonance Imaging) for public comfort. This hoax appear to enjoy the same publicity as that about microwave ovens causing food toxicity. Those claiming to be green have no idea what green is green. Microwave heats the food from the inside out; it is therefore far more energy efficient than stove cooking which must first heat the pan. Our intention is to cook the food, not the pan. The worse microwave ovens can do is heating certain types of food unevenly. We just need to put the right types of food in, keep the wrong types of food out. Figure 3: The robotic arm. detectors — either many detectors arranged around the ring, or a single detector module ready to rotate around the ring. During radiotherapy, summation of these many interceptions is needed to deliver an optimal dose to the patient. This is the principle behind IMRT (Intensity Modulated Radiation Therapy). During scanning or imaging, these interceptions are needed for sufficient tell-tale data to be collected. We now reach an opportune point to introduce CT. CT (Computed Tomography) is basically an X-ray machine plus clever mathematics. We inherited this clever solution from Sir Hounsfield; the solution won him a Nobel prize. Whereas the classical X-Ray machine gives us 2D images of shadows; the CT machine gives us 3D images of what casts the shadow. Why can't we do without the many beam-body interceptions from various angles? The need is mathematical. Recall solving simultaneous equations at school. We need two simultaneous equations to solve two unknowns; less than two equations, we won't be able to derive the unknowns. We need three equations to solve three unknowns; any less than three, we won't be able to derive the unknowns. Imaging the body entails so, so many unknowns — therefore in order to derive the solution we need many beam-body interceptions from various angles. Just a few tens will not do. Now, back to the doughnut. 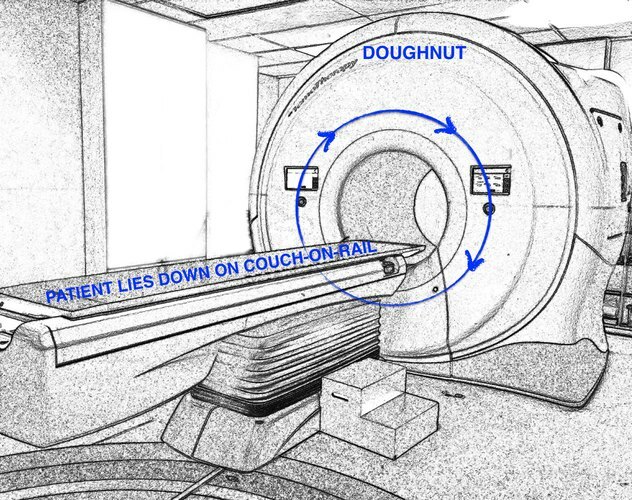 The gantry (Figure 2) is an alternative design to the doughnut. Conventional radiotherapy machines including the older cobalt machines come in this form; gamma cameras too. The entire gantry rotates, achieving the same full-circle coverage around the patient for the same purpose. The rotating machinery, in this case, is no longer hidden, but visible. The robotic arm (Figure2 3) breaks lose from that fixed full-circle prescribed by the doughnut and the gantry designs. 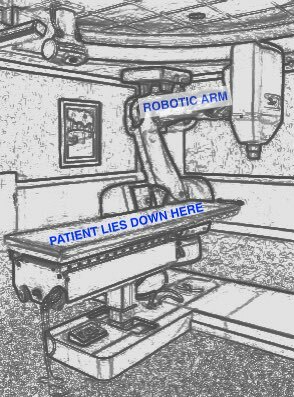 The robotic arm can move and aim the beam at the patient's body from almost any angle, offering unprecedented geometric flexibility, versatility and precision. The commercial brand name is Cyberknife, which is available to those who can afford. 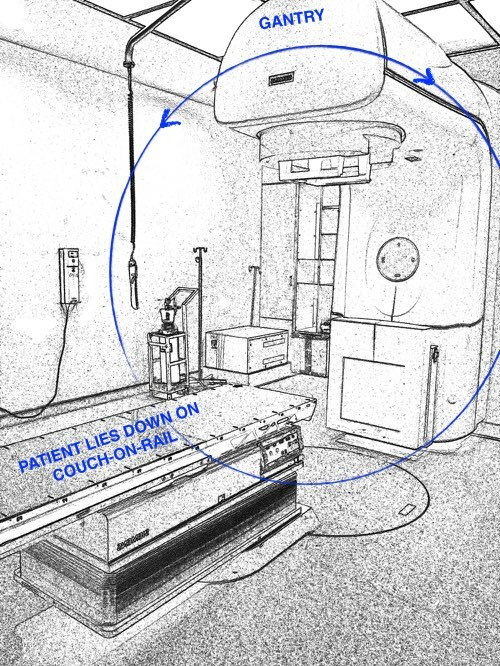 A brief summary: we have seen three generic machine designs for imaging and therapy. The three are: doughnut, gantry, robotic arm. A common theme is geometry. In all cases mentioned above, whether imaging or therapy, the machine needs to aim at the patient from different angles. That necessarily requires the machine to be large enough to almost reach the ceiling. These machines operate by physics principles, as opposed to chemistry-based procedures e.g. tests of body fluids (blood, urine etc), drips, injections and medications — all of which would not need elaborate machinery like their physics counterparts. As we saw earlier, most cancer treatment is based on the principle of attacking toxicity by introducing toxicity into the body. This explains why we get side effects. It also explains why radiotherapy is typically fractionated — daily dose given by instalments over several weeks — to give chance for good (non-tumour) cells to catch up and recover. We can afford a higher dose so as to whack the tumour more forcefully. We used to be more constrained. We refrain from full-force whacking, as a compromise, to allow recovery of by-standing non-tumour cells inevitably exposed to the toxicity we introduce into the body. We can whack the tumour with a tighter margin. Margins used to be more generous, as a compromise, to cover possible geometric misses. Table 2. The four possible outcomes of a treatment; only one is desirable. Chart 1: Classification of radiotherapy according to delivery mode. incorporating same-day if not real-time imaging as the patient receives each RT fraction, so that we base the treatment on the CT or MRI here and now rather than the CT or MRI a fortnight earlier; this is to account for morphological changes (e.g. tumour size) and body transients (e.g. bowel filling and breathing motion at different times); this is often referred to as IGRT (Image Guided Radiation Therapy). Recent technology meets both criteria in an unprecedented way. Such machines come in the form of high-precision accelerators, Tomotherapy or Cyberknife (introduced in the previous section). This specialised delivery mode is termed stereotactic, typically called either SRS (Stereotactic Radiosurgery) or SBRT (stereotactic Body Radiotherapy). The two terms SRS and SBRT differ by the part of the body that receives RT. Internal RT, as opposed to external RT, does not require big machines. As radioactive sources are inserted directly into the tumour site, we no longer need to worry about an external beam missing the tumour due to poor aiming of an external beam to the tumour within the patient. Brachytherapy is a form of internal RT; it is commonly used to treat gynae cancers, where flexible wires transport radioactive seeds from a machine (typically of the size of a child) into the tumour site. In cases where the flexible wires are retracted e.g. around tens minutes later, the patient may be released after the outpatient procedure. In cases where the radioactive seeds remain in the body for days, or longer, we call the procedure a brachytherapy implant. Another common form of internal RT is nuclear medicine, where radioactive sources are introduced direct into the tumour site in the form of a radioactive liquid. Many thyroid cancers are treated this way. Internal RT and the majority of external RT deliver the tumour-damaging effect by way of photons and electrons. Chart 2: Classification of radiotherapy according to particle type. The remaining minority of external RT damages tumour by way of hadrons, which take us beyond inherent limitations of photons and electrons, beyond Tomotherapy and Cyberknife. The differentiation from conventional RT is no longer those baby steps of geometric aiming and precision. Given their better behaviour within the body, hadrons spare non-tumour cells far better than photons and electrons. Among candidate hadrons, proton therapy is most common. Radiotherapy use of hadrons is not yet widely available; its footprint is far from global. Note that oxygen and nitrogen here are not gas-form oxygen and nitrogen but energetic heavy ions. Chart 3: Classification of radiotherapy according to source type. Boron neutron capture therapy (BNCT) deserves some explanation here. It damages tumour by way of alpha and lithium, not neutron. BNCT is not neutron therapy, which has been a taboo since failing some trials. Neutrons are indeed used in BNCT but neutron itself is not the tumour-killing agent. In BNCT, a chemical compound is injected into the body. The compound contains a tumour seeker and 10B. In the absence of neutrons, nothing happens. Neutrons beamed into the body triggers the release of alpha and lithium by 10B. It is alpha and lithium which destroy tumorous cells. BNCT stands out as a chemically targeted form of radiotherapy. Targeting is accomplished by tumour-seeking compounds; Japan and Italy lead in research. Treatment modalities delivering the same particle type may originate from different source types. External photon-and-electron RT and external 60Co (Cobalt-60) all damage tumours by way of photons and electrons. The source type, however, differs. 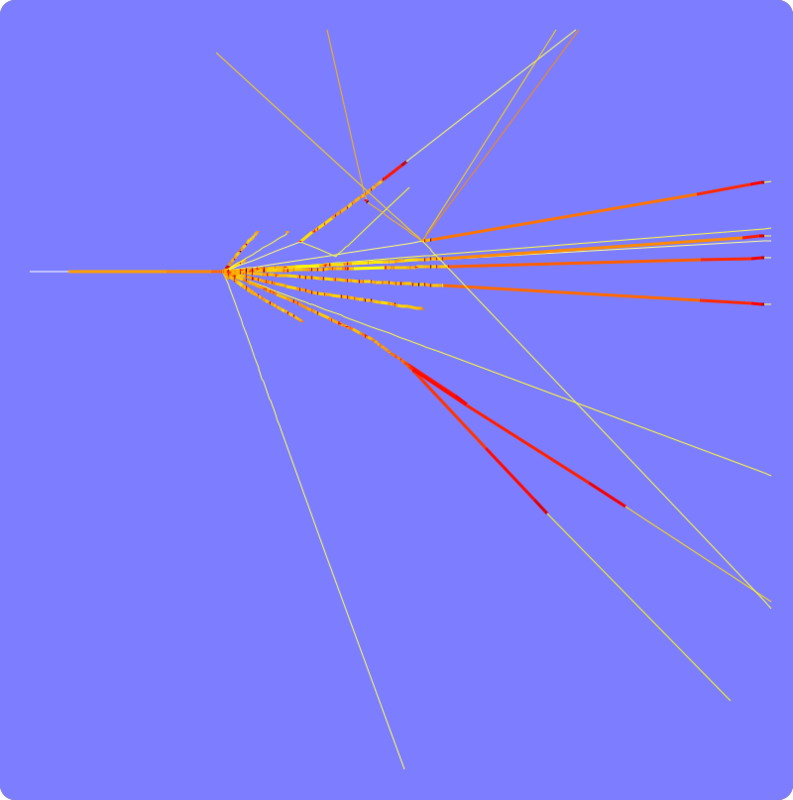 The former gets its supply of photons and electrons from a linear accelerator; the latter gets its supply from a naturally-occurring radioactive source. Naturally-occurring radioactive sources is static, stepping and liquid in the case of 60Co machines, brachytherapy and nuclear-medicine thyroid therapy, respectively. The most common radioactive source for brachytherapy and nuclear-medicine thyroid therapy is 127Ir and 99mTc, respectively. Why 60Co, 127Ir and 99mTc? Let us begin with the periodic table. Whereas generated sources may be switched on and off, naturally-occurring radioactive sources cannot. When not summoned for therapy use, naturally-occurring sources are either allowed to decay down to negligible levels (as in thyroid therapy via nuclear medicine) or shielded around so that radiation exposure outside the housing becomes negligible (as in cobalt machines and brachytherapy). Radiotherapy treatment rooms for external photon-and-electron RT are typically labelled LA1, LA2 etc. LA for linear accelerators. Accelerators in the medical field are typically linear anyway. Hadrons for mainstream hadrontherapy are produced from cyclotrons. So far, neutrons for BNCT are mostly produced from reactors; there has been efforts researching alternatives.